… pedestrians can choose to split off on lower paths, built intentionally to have a few centimetres of water flowing across. The river-level crossings seem to be a big hit with kids and dogs. As the trail crosses under the Don Valley Parkway, some old-school wayfinding signs point out some options. Sadly, they've been vandalized and have fallen into disrepair. You may have seen these peculiar sculptures from the highway, but here you can see them up close on your bike. Created by artist Noel Harding, they are functional pieces of art meant to foster better environmental stewardship. This charming bridge beneath Don Mills Road looks straight out of a Frontier-era theme park. It's here where we connect with the Don River. Nature abounds here, and riding along this stretch is peaceful and quiet, despite the Don Valley Parkway being close by. This dry and isolated pebble beach off the trail just north of the Millwood Road bridge is a perfect place to consume a packed lunch or catch some rays. The Millwood Road bridge is remarkably imposing, but has some quirky touches, like the random geometric shapes formed in its concrete. Passing under a bridge can bring some sobering sights, however, like this simple memorial to a nineteen-year-old man who jumped from the bridge in 2005. Take a quick detour along the dirt path beside the bridge and you'll find this miniature beach. The Don River can be surprisingly beautiful in those areas where we didn't ruin it. This is the downtown Toronto that few people get to see. 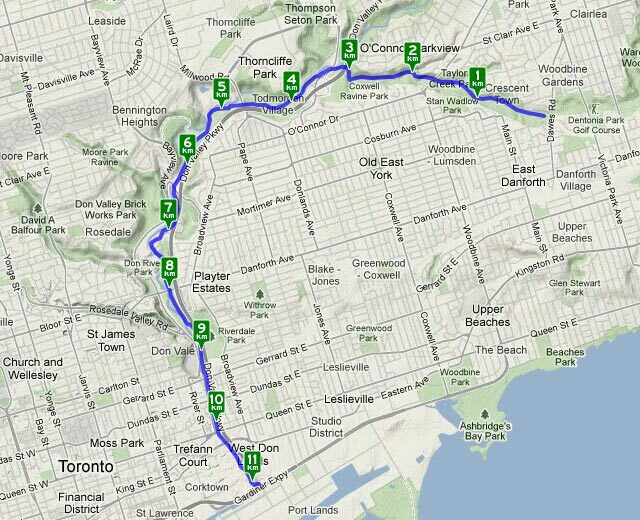 The path feels removed from the Don Valley Parkway throughout most of the route. This is the closest it gets to the traffic before descending toward the Brick Works complex. 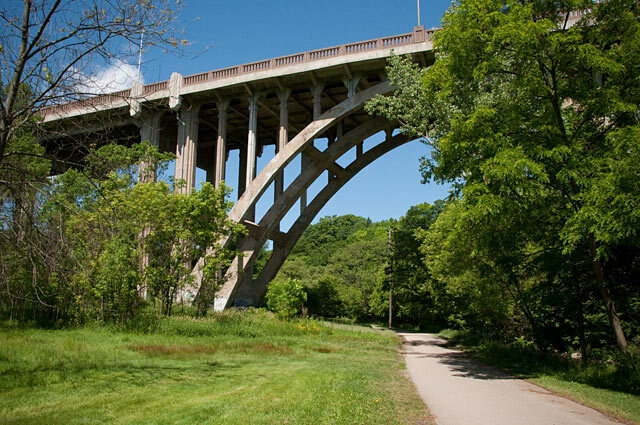 The mighty Prince Edward Viaduct is a highlight of the Don Valley recreation trails. Built in 1918, the double-decker was designed for rail transportation as well—now used for the Danforth subway line. They don't build 'em like this anymore. Does <a href="http://torontoist.com/2010/05/minding_manr_banksy_manning.php">MANR</a> know about this? This culvert passes under the train tracks located between the DVP and Bayview Avenue. Still relatively isolated but much closer to urbanization now, tagging becomes ubiquitous. Crossing the Don River for the last time, down below Riverdale Park. A view of the Riverdale Park footbridge, followed by Gerrard Street, Dundas Street, and Queen Street. We witnessed a good citizen tying trash bags all along the trail and then gathering them back up later. Encouragingly, people actually seem to be using them. There may be some sketchy stuff going on in this foliage, but it's a beautiful canopy, countering the increasing industrial vibe of the Lower Don. Watching people carry their bikes awkwardly, we're not sure people realize that the green troughs alongside the stairs to Queen Street are for bike wheels. The defunct Old Eastern Avenue Bridge (1933) is a hotspot for urban explorers. There's a big hole in the fence, but you didn't hear it from us. Welcome to Toronto! Sorry, we're closed. Nature coexists with industry beside a decommissioned rail bridge. As the route nears its end, cyclists and pedestrians can see a different perspective on the tangle of highway ramps. Immediately west of the trail is a railyard where GO Trains are serviced. The route terminus at Lakeshore Boulevard and the Don Roadway is also the spot where the Gardiner Expressway splits off into the Don Valley Parkway. Four separate roads soar overhead. The eleven-kilometre recreation trail running from Taylor Creek Park to Lakeshore Boulevard is one of Toronto's best-kept secrets. Many of Toronto’s avid cyclists are aware of our network of bike trails, but for the most part, the slice of pseudo-wilderness cutting a swath through the Don Valley and along Taylor Creek is one of the city’s most woefully neglected attractions. Those who use it may like it that way (its obscurity keeps bike and foot traffic relatively sparse), but we think it’s a treasure that should be celebrated. Though the route also splits off near Don Mills Road, passing behind the Ontario Science Centre and up to Edwards Gardens, we chose to highlight the easterly jaunt, with its terminus at Dawes Road (near Victoria Park Avenue). Lakeshore Boulevard at the Don Roadway provides the other access point. What makes this particular course appealing is how it begins with dense foliage and the meandering, rocky river, eventually becoming more urbanized as you head south, kissing the edge of the Don Valley Parkway and passing under rusting expressway ramps near the portlands. The charm lies in quirks like the odd water crossings in Taylor Creek Park, the mammoth foundations of the Prince Edward Viaduct, and experiencing some wetland efforts meant to undo the environmental damage done by the industrialization of the Don River. Most of all, it’s a magnificent and surprisingly tranquil chunk of nature running clandestinely through the heart of downtown Toronto. You’d hardly know it, because access to the trail is virtually invisible from street level, and existing wayfinding signage is minimal and decrepit (there is an official map, but it’s confusing and overcomplicated, natch). Because the stretch running alongside the DVP is sunken into the valley and the traffic passes up high, the presence of such a major highway is often barely noticeable and a lot quieter than you’d expect. Toronto’s tourism campaigns don’t include scenes of river rapids and and dense valley flora, but perhaps they should—we’re positive that many visitors would much rather spend their summer afternoon on a bike than wait in line at the CN Tower. As for Torontonians, it’s a big ol’ backyard many of us didn’t even know we had. Main access points to this route near vehicle parking are from Taylor Creek Park, Stan Wadlow Park, E. T. Seton Park, Coxwell Ravine Park, Riverdale Park, and the Queen Street Bridge at Bayview. The southern terminus can be accessed by bike from the Lakeshore East bike pathway, which runs from Beaches Park to Lower Sherbourne.